In February 2018, Kate Fitzharris arrived in Whanganui from the other end of the country – Waitati just outside of Dunedin – to be artist-in-residence for five months at Tylee Cottage with the Sarjeant Gallery. The residency offered Fitzharris the opportunity to research, consider and begin a new body of work. 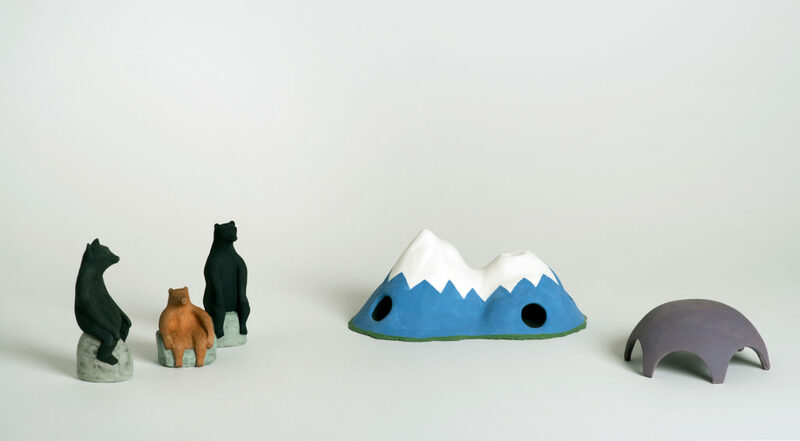 Fitzharris studied ceramics at Otago Polytechnic and the medium of clay has held her attention ever since. From the outset her practice has been deeply interested and invested in the language of objects that largely reside in the domestic realm. This exhibition represents a year long journey for the artist, who also works part time as a librarian, and it was the concept of a library that was the genesis of this project. During her time in Whanganui Fitzharris made an open call for members of the community to share with her ceramic objects that were important on a personal level and had stories attached to them. The brief for what that object could be was essentially that it was made from clay, hence the diverse array of items that surfaced for the project. These range from electrical insulators, bricks, E.T. figurines, playing boxer dogs, fighting boxing men to more recognisable everyday domestic items like cups, jugs and containers. A selection of these objects can be found on display in the exhibition. So what does an artist do with a memory bank of objects and stories associated with them? In the case of Kate Fitzharris she takes them home, mixes them all up, adds equal parts of sensitivity, charm, mystery, imagination and skilled making then crafts her own collection of stories that have at their core other peoples’ narratives and memories. So if this show was a book how should we read it? Well in this instance, we don’t need words, you’ll notice a distinct lack of labels for individual works, so instead take your cues from the ‘Library of things’. From these objects you’ll find echoes in the beautiful works that Fitzharris has made, they’re all interconnected by loops, lead characters, chains and imagination.